will fulfill our hopes of unparalleled advancement only if scientists from different disciplines can work together creatively. Unfortunately, initiating these kinds of interdisciplinary conversations in the context of academia can be a costly undertaking, where disciplines are separated by entrenched physical and social structures. After reading the book Blink, by Malcolm Gladwell, I realized that his concept of “thin slicing” could also be applied to research and in particular to rapidly search for the most creative ideas. Along this line, we have developed and tested a new method, called “speedstorming”, a pair-wise idea generation process that works similarly to the round-robin “speed-dating” technique, designed to improve the process of teaching and initiating creative collaboration. Speedstorming combines an explicit purpose, time limits, and one-on-one encounters to create a setting where boundary-spanning opportunities can be recognized, ideas can be generated at a deep level of interdisciplinary specialty, and potential collaborators can be quickly assessed. 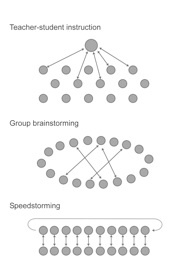 By directly comparing speedstorming to brainstorming, we have shown that ideas from speedstorming are more technically specialized and that speedstorming participants are better able to assess the collaborative potential of others. We believe that speedstorming could be used in a variety of applications and settings.